Take a look at this infographic by CTIA – The Wireless Association. 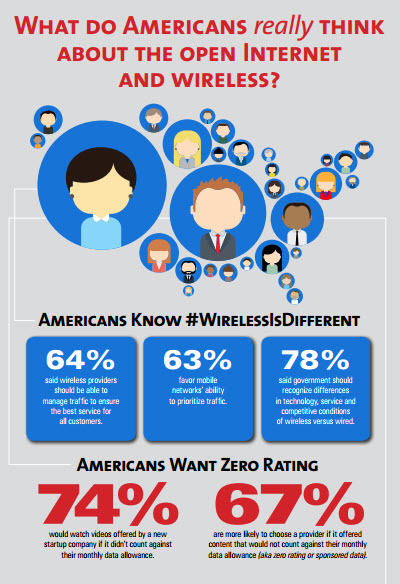 A vast majority of Americans (78 percent) recognize that wireless is different from wired broadband services and warrant a different approach to regulations like net neutrality, according to a Mobile Wireless Service Survey (PDF) released today by CTIA-The Wireless Association®. Conducted by TechnoMetrica, the survey shows a glaring disconnect between the views of a majority of Americans on regulation, mobile services and net neutrality and the policy direction currently being pursued by the Federal Communications Commission. This entry was posted in Technology and tagged internet, mobile technology, net neutrality, open internet, technology, wireless technology by WIPP. Bookmark the permalink.